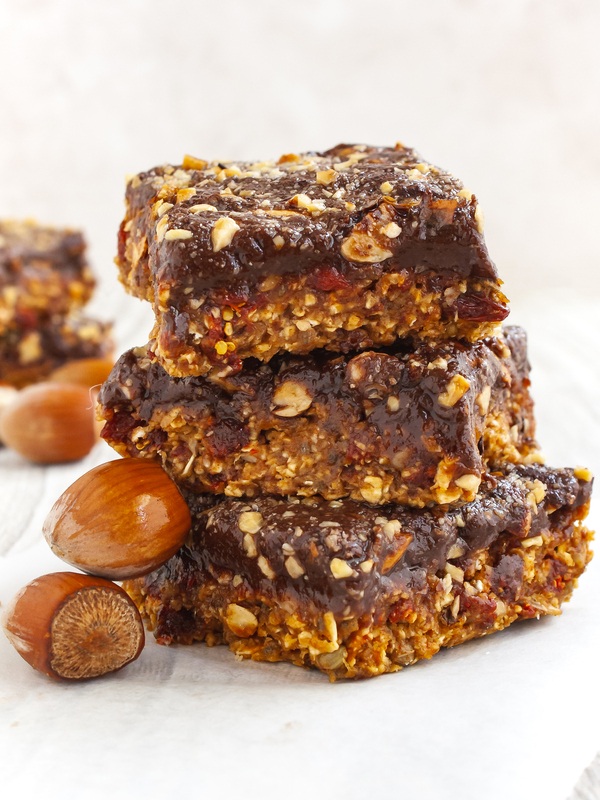 These healthy date bars are prepared with a rich mix of oat flakes, chia seeds, and Goji berries topped with a creamy layer of chocolate tahini and roasted hazelnuts. 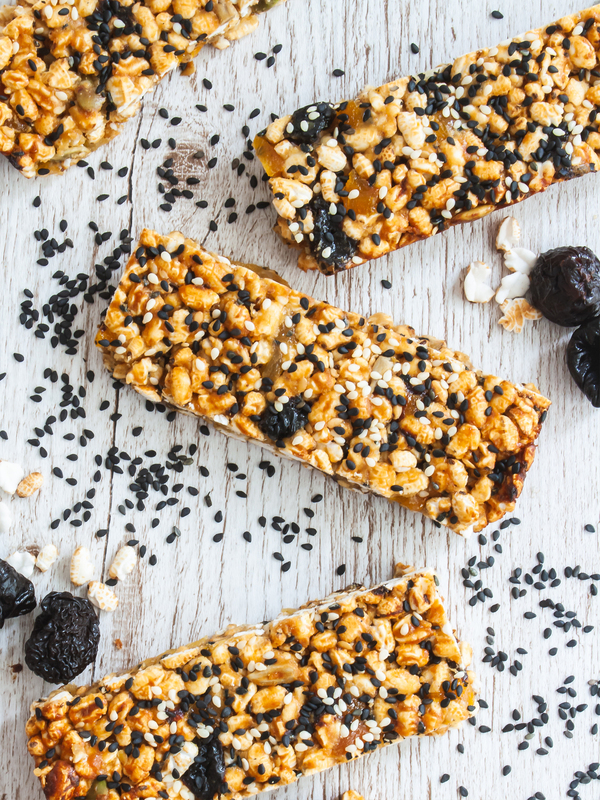 With our easy step-by-step recipe you can prepare an energy protein bar that is a great idea for a workout snack or breakfast treat on the go thanks to its nutrient-rich ingredients. 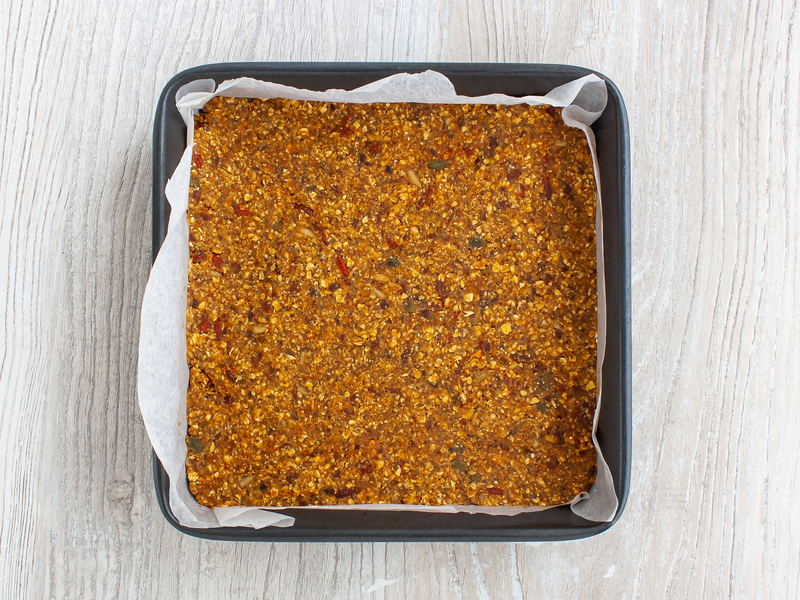 You can prepare these tahini oat bars over the weekend and store them in the fridge or freezer to always have at hand an energy-boosting treat to fuel your day. If you want to know more about the nutritional profile of this recipe, just click the nutrients tab above! These healthy dates bar with oatmeal provide a source of healthy fats which comprises monounsaturated and polyunsaturated fats which, unlike the saturated ones, help to reduce bad cholesterol levels. 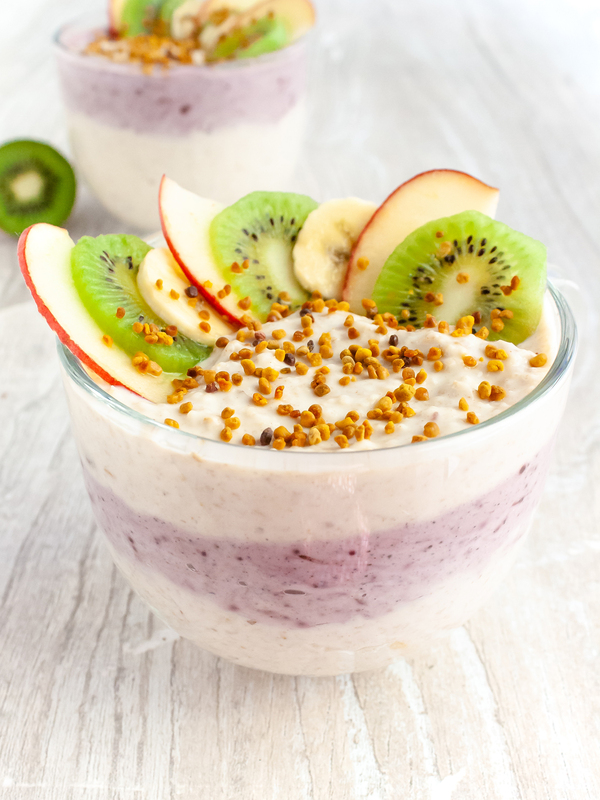 In fact, hemp seeds, sunflower seeds, pumpkin seeds, flaxseeds, and sesame seeds are rich in these healthy fats and they also provide a source of protein and fibre. 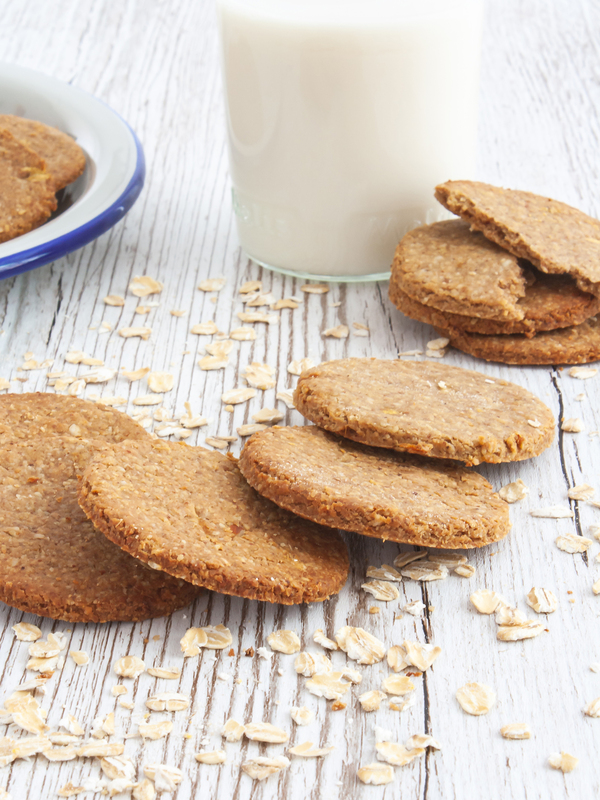 And let&apos;s not forget that these oat bars taste so delicious with their gooey chocolate cream! They can satisfy your sweet tooth without guilt as they are made only with natural sugars with a low GI. Preheat the oven to 150°C (300°F) for static oven or 130°C (265°F) for fan oven. 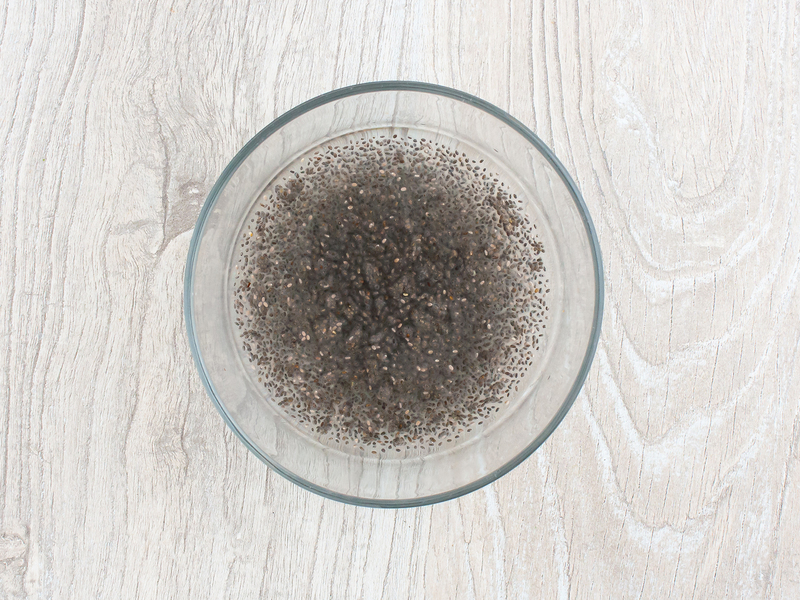 In a small bowl, soak the chia seeds with water for 10 minutes or until they have swollen up and have a jelly-like consistency (1). 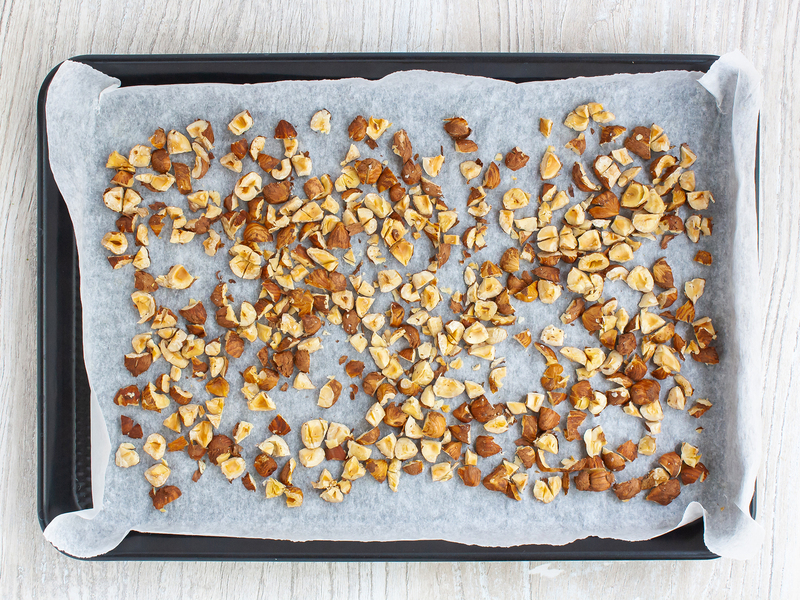 In the meantime, chop the hazelnuts and roast in the oven for 10 minutes until lightly golden (2). 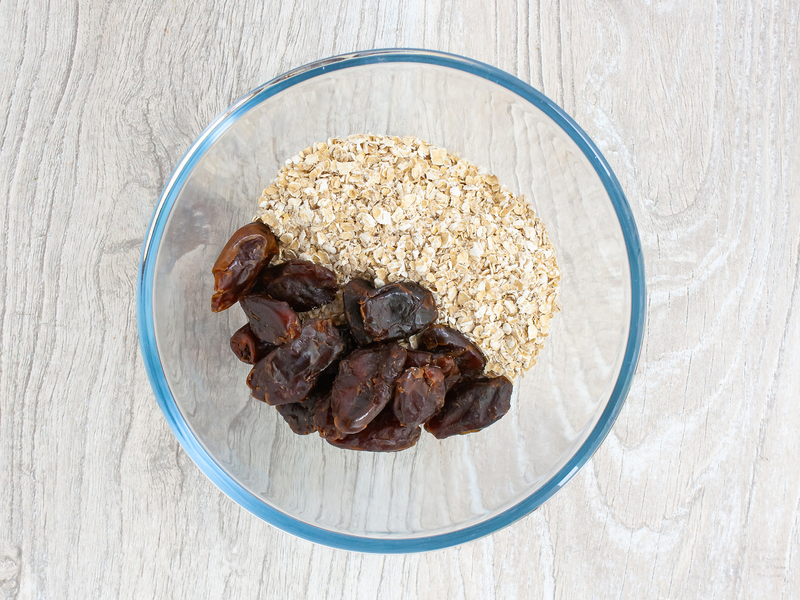 Next, blitz the dates and oat in a food processor (1) until you have a crumbly mixture. 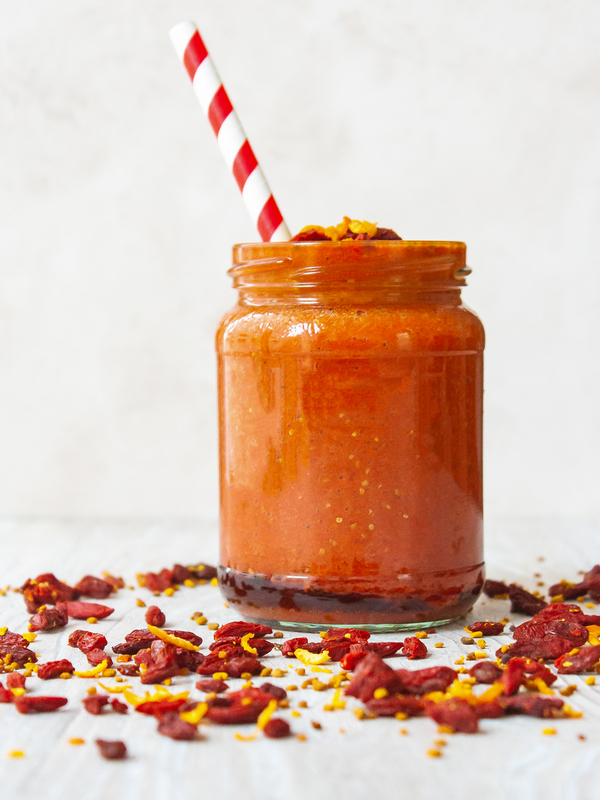 Transfer to a large mixing bowl and add dried Goji berries, sunflower seeds, pumpkin seeds, hemp seeds, and flaxseeds. 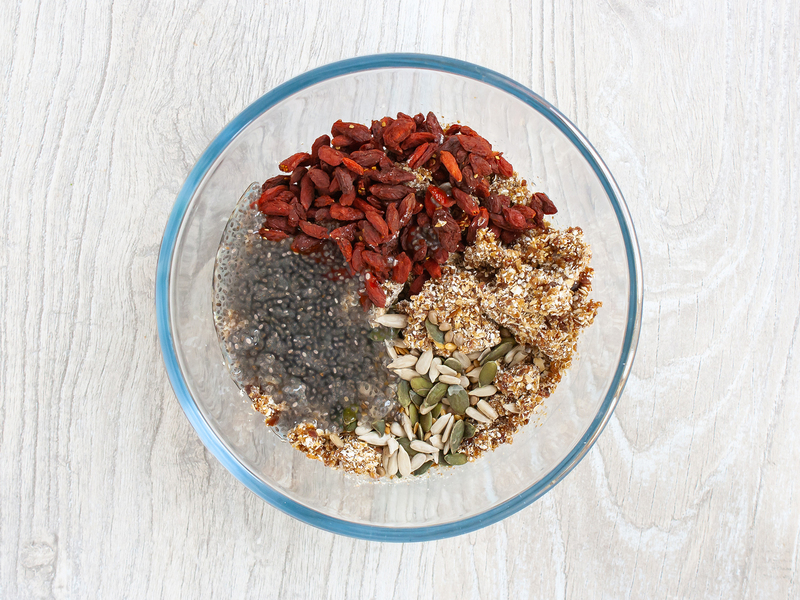 Add the soaked chia seeds and mix well to incorporate the ingredients (2). Knead the mixture with your hands if needed and make sure it&apos;s firm and bit sticky. Line a 20 cm x 20 cm (8 x 8 inches) square baking tray with parchment paper. Pour the prepared mixture in the tin, press down firmly into a 1 cm layer, and place in the fridge. 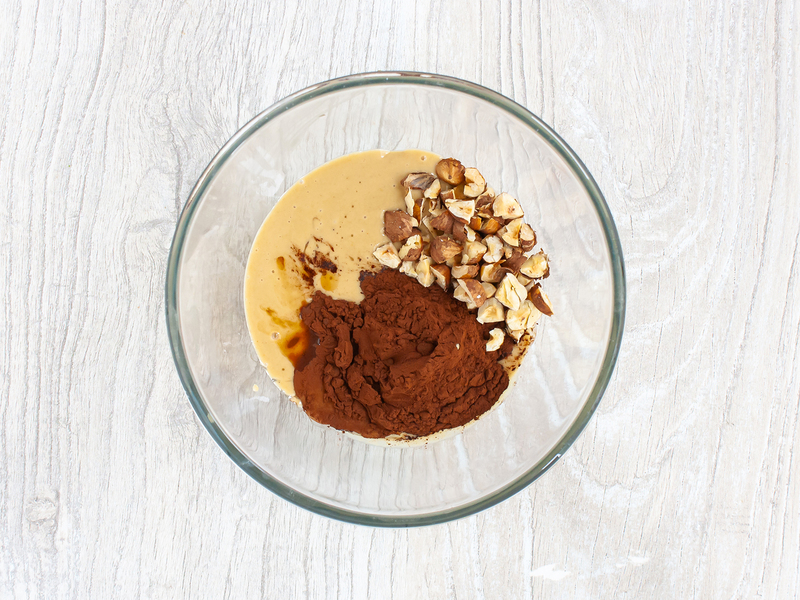 In a mixing bowl, combine tahini, agave nectar, cacao powder, vanilla extract and two-thirds of the roasted hazelnuts (1) into a smooth paste. 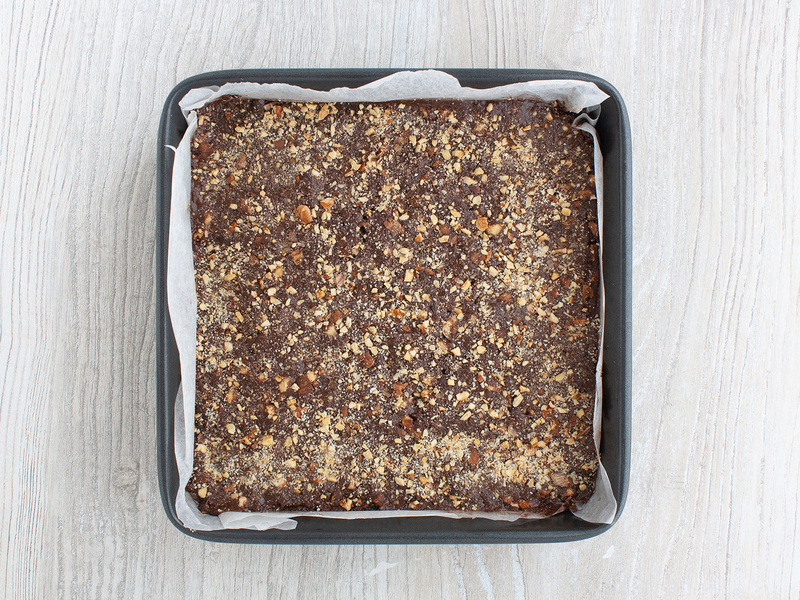 Spread the chocolate tahini over the oat layer and level with a spatula (2). Sprinkle the top with the remaining chopped roasted hazelnuts (1). 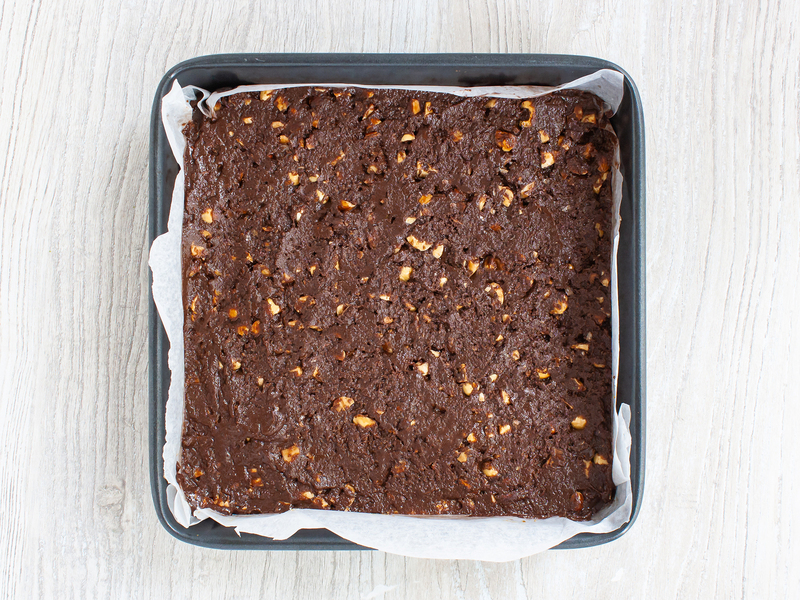 Keep in the fridge for at least 20 minutes before cutting into bars or bite-sized squares (2). The default ingredients yield 12 energy oat bars but you can easily adjust the servings from the ingredients tab and we&apos;ll do the math for you. 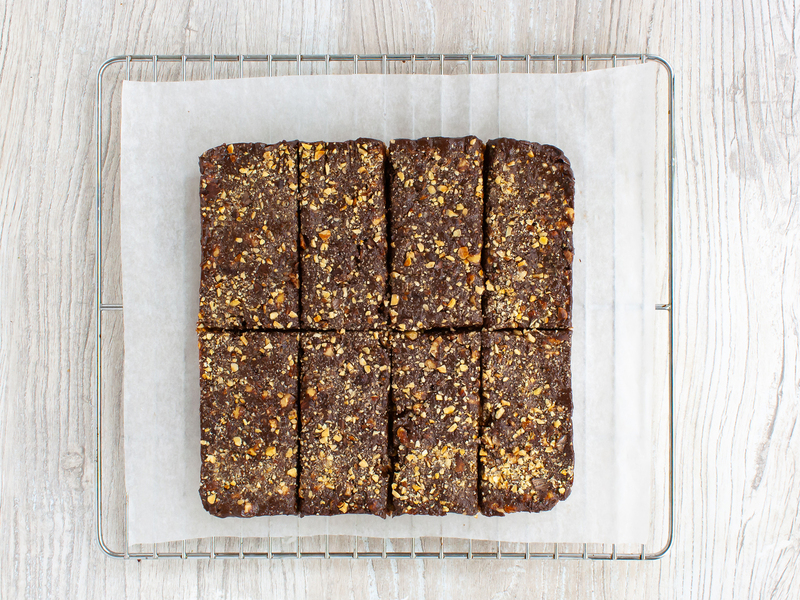 Make a big batch of these chocolate tahini energy bars and store them in the freezer ready to eat whenever you need a boost of energy.